In spite of the successful performance during the 1993 season, Minardi was finding it increasingly tough to make ends meet. 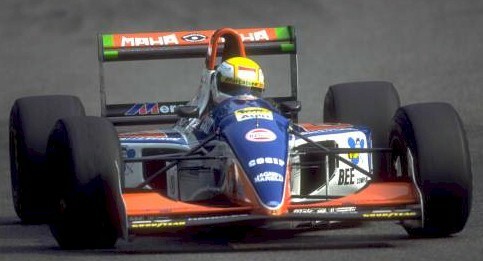 As a result, Gian Carlo Minardi sold two thirds of the team to steel magnate Beppe Lucchini, who sought to merge his Scuderia Italia team with the Faenza based squad. Scuderia Italia had bagged podiums with JJ Lehto and Andrea de Cesaris in 1989 and 1991 but the 1993 season had been a disaster and Lucchini was looking for a way to get his costs down. Scuderia Italia Minardi (Italian Minardi Team) was born. The positive side effect of the merger, apart from more financial security, was the arrival of veteran Italian driver Michele Alboreto, who would finish his long career that year. He was joined once again by Pierluigi Martini. The duo performed very well, especially at the start of the season, with Martini qualifying in ninth position for the Monaco Grand Prix and Alboreto scoring the first point of the season by finishing the race in sixth position. Not to be outdone, Martini came in fifth at the Spanish Grand Prix and two races later at Magny Cours. Alboreto came close to scoring once more at the Hungarian Grand Prix but only finished seventh. At the end of the season, Martini had outqualified Alboreto 13 to 3. Lucchini was looking at selling his stake in the team after the seaon, but Minardi would enter as "Scuderia Italia Minardi" one more time.